WELCOME! Thanks for checking out my website! I hope you find some interesting information and try some and/or many of the recipes that I have posted. Please give me comments through email and let me know what you think about the recipes. Perhaps we may see you at one of the upcoming events soon? - S.
Some pictures from our 2014 trip to Nassau NY and Hancock Shaker Village in Hancock, MA. Tools displayed for gathering, drying and sorting heirloom seeds used at the village site. (Double click on a photo and it will open a new window in a larger size to view). #1 - Poster of Garden Tool Shed. Welcome to my website! My name is Susan Luczu and I hope you enjoy the journey with me while I explore the world of food and beyond to many different crafts and skills that interest me. I have had a passion for foods all my life and relish the challenge to try new things. I collect cookbooks, kitchen accessories and all types of open-hearth implements and tools. 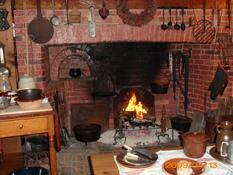 My current calling is in open-hearth cooking, I reside in Central New Jersey in a home built in the early 1700's. We have a cooking fireplace in the living room and enjoy the quirks of living in an "OLD" house.